Sunday the 17th of May saw a wet day for our meeting this year, so just as well we were indoors and did not notice it until it was time to leave!!! 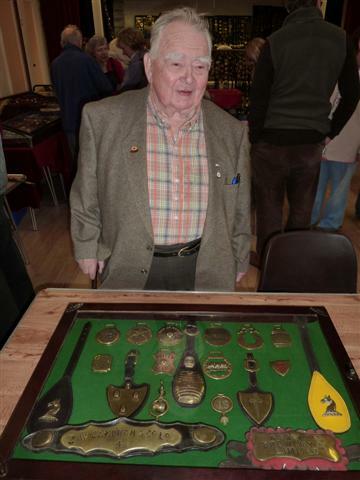 Despite the weather another good meeting was had by all and there were several nice collections to look at this year. As usual, Mark Roberts came down from North Wales and brought his big collection for us to look at again, which is always nice to see. Left; Ian Jones (kneeling) and Ralph Chapman discussing the various merits of items in Mark Roberts's large collection, which fills the entire stage at this meeting. It is always nice to see this extensive collection and perhaps pick out those items that we might like to find one day; The effort required to load this collection and travel with it both ways is never easy for Mark (who is over 80 years of age) so well done once again, and to all those who helped to port it in and set it all up. Left; Allan Brewer and his collection This is also another nice collection to look at. Allan is also a talented leather worker and does fine work mounting new brasses and repairing old items that have suffered the ravages of time. Yet again a great deal of effort was required to get this collection here today, so well done Allan for contributing to another great meeting here today. Also present today was Gron Williams who travels from the same part of the world as Allan (above) and is able to share the trip therefore reducing their Carbon Footprint; At least no-one can say that horse brass collectors arent green eh? Those who know Gron will tell you his passion (apart from Real Ale) is of course Brewery Brasses and Gron bought part of his collection to show us today. Left; Gron Williams and his representative collection of Brewery Brasses. Gron is also the author of two NHBS publications on the same theme, which are extremely informative. Once again however, the day goes by so quickly and once the raffle was done and dusted, members drift off home after another great meeting. So thanks once again to Stan Benton who organises this very popular meeting, and all of those that helped to make the day such a success and to those who travel from near and far to buy, sell, and just to look. We hope to see you again next year.